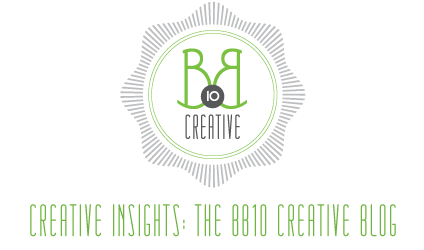 Welcome back to the BB10 blog in 2011! Hope you all had a great New Year! 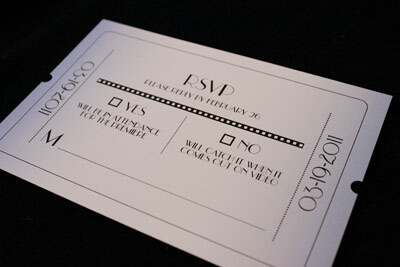 I’ve been hard at work creating and designing invitations for the 2011 wedding year. It’s going to be another busy and fun year with lots of different invitations on the horizon. My first clients for 2011 are good friends of mine and I’m so excited for their big day. I have known Cate since freshman year of high school, so we go waaaay back. Cate is a pretty laid-back person, pretty much the extreme opposite of a “bridezilla,” so she was very open to invitation ideas and passed that wedding duty along to her fiance, Chad. It may be an understatement to say that Chad is a big movie fan, so the theme of the wedding and invitations was immediately clear for him. Movies. I wanted the wedding invitations to fit the theme, yet still be simple and classy and of course, fun! The challenge for me in designing these was working in the wedding colors of cornflower blue and yellow, while still keeping with the movie theme. 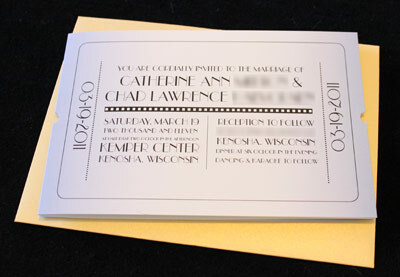 I sent Cate and Chad two design options – one was more of movie poster idea and the other was the string of movie tickets idea. I secretly hoped they would pick the tickets and they did! The tickets were printed by a local professional printer in Milwaukee on a plain white coated cardstock, then folded to fit accordingly in a shimmer gold A6 envelope. I used a light blue gradient design on the cards to tie in the main color without making them too “clowny”. 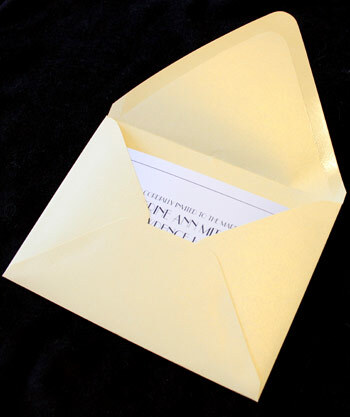 Chad wanted the invitation envelopes to have an Academy Award feel to them, and I think the shimmer gold envelopes fit the bill perfectly. 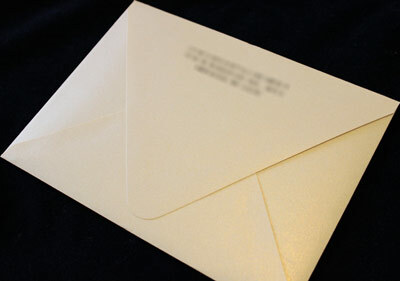 They are light enough to appear yellow, and have a large flap on the back similar to the award envelopes. And the award goes to…. 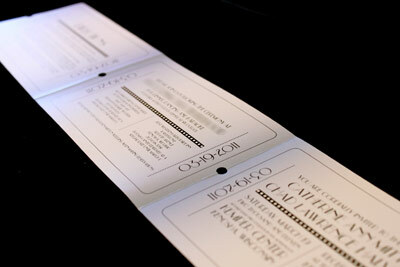 Overall I’m really excited with how these invitations turned out. It’s always fun having a theme to work in and be able to make the wedding invitations really unique for the couple. Check back soon for a new Save the Date design as well as other fun posts from BB10 Creative.